Charlotte’s Web is the much-loved children’s book by E.B. White, about the risks and satisfactions of friendship. This stage rendering by Joseph Robinette, is delightful, funny, and thrilling. It is entertaining for adults as well as children. It tells the story of a runty pig, Wilbur, and his friendship with a wise spider, Charlotte. Theatre Company of Saugus is excited to present this show with its large cast of adults and children, portraying adults, children, and a whole barnyard of talking animals! Tickets will be $15 for adults, or $12 for seniors, students, and children. To purchase or reserve seats, please see our Tickets page. 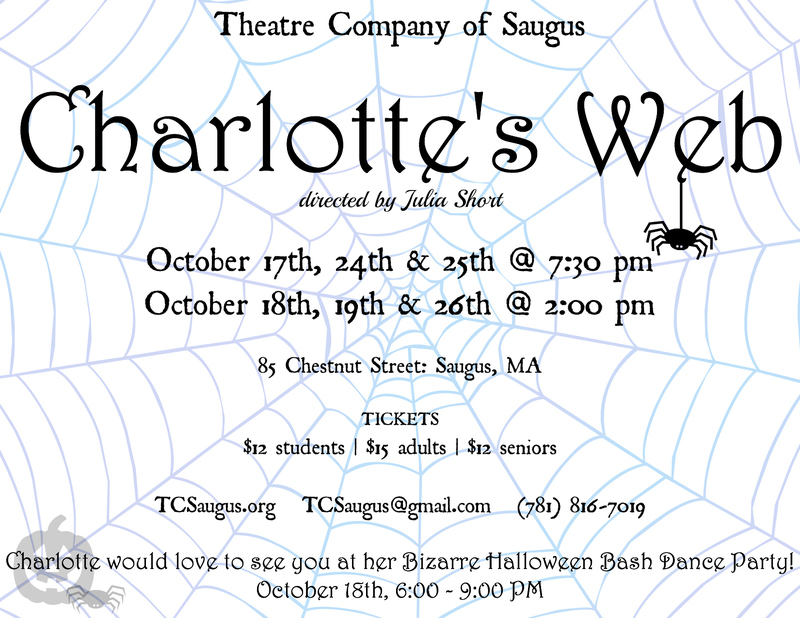 The venue is the Theatre Company of Saugus home at East Saugus United Methodist Church / 85 Chestnut Street / Saugus, Massachusetts 01906. Please see our Directions page. Stay a while after the first matinée on Saturday 18 October for some more fun at our annual Bizarre Halloween Bash Dance Party, starting at 6:00 PM. The director of Charlotte’s Web is Julia Short. Her previous directing credits include Saint John the Divine in Iowa for Another Country Productions at Boston Playwrights Theatre, along with two SLAMBoston plays, Slugger (March 2011) and The Greening of Bridget Kelly (November 2011). As an actor Julia has worked with numerous area theaters including The Perishable Theatre, Salem Theater Company, Stratton Players, Sea Change Theater, and Another Country Productions, among others. She has studied at Northeastern University, CP Casting, and Another Country Productions Meisner Programs. Our producer is Nancy Welch, and the stage manager is Jess Stockton. If you would like to help out with the show, either backstage or front of house, please Contact us. The play script of Charlotte’s Web is by Joseph Robinette, adapted from the book by E.B. White. It is produced by special arrangement with The Dramatic Publishing Company of Woodstock, Illinois.